Qatar General Insurance & Reinsurance Co. Q.P.S.C announces the convention of its Ordinary and Extraordinary General Assembly Meetings consecutively on Monday 15th April 2019 at 6:30PM at Marriott Hotel (Doha) – Ras Abu Abboud. The meetings were chaired by H.E. Sheikh Nasser Bin Ali Bin Saud Al Thani, the Chairman of the Board of Directors. 1- Shareholders’ General Assembly approved by majority the Board of Director’s Report on the Company’s activities and its financial position for the financial year ended 31/12/ 2018 as well as the Company’s future plan. 2- Shareholders’ General Assembly approved by majority the External Auditor’s Report for the financial year ended 31/12/ 2018. 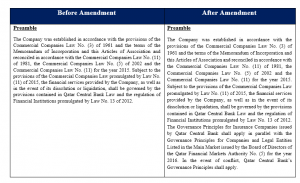 3- Shareholders’ General Assembly approved by majority the Company’s Balance Sheet, profit & loss accounts for the financial year ended 31/12/2018, after deducting an amount of QR /500,000,000/ (Five Hundred Million Qatari Riyals) from the Retained Earnings Account and allocating such amount to a special reserve account named “Risk Reserve” (which cannot be disposed of without the approval of Qatar Central Bank), in compliance with Qatar Central Bank’s instructions as a hedging against any risks. 4- Shareholders’ General Assembly unanimously approved the Board of Director’s proposal to distribute cash dividends to the Shareholders for the financial year 2018 at the rate of (10%) of the nominal value of the share (equivalent to QR /1/ per share). 5- Shareholders’ General Assembly unanimously approved releasing the Chairman and members of the Board of Directors from liability for the financial year 31/12/2018, and approved their remuneration. 6- Shareholders’ General Assembly unanimously approved the appointment of Messrs. KPMG, as the Company’s External Auditors for the financial year 2019 with fees of QR /850,000/. 7- Shareholders’ General Assembly approved and adopted by majority the Company’s Corporate Governance Report for the year 2018. 8- Shareholders’ General Assembly unanimously approved the Nomination and Election Regulations for the Board membership and delegated the Company’s Board of Directors to incorporate any required amendments on such document in alignment with the instructions, circulars, regulations and laws issued from time to time by the relevant Competent Authorities and to always publish the amended versions on the Company’s Website. 3. 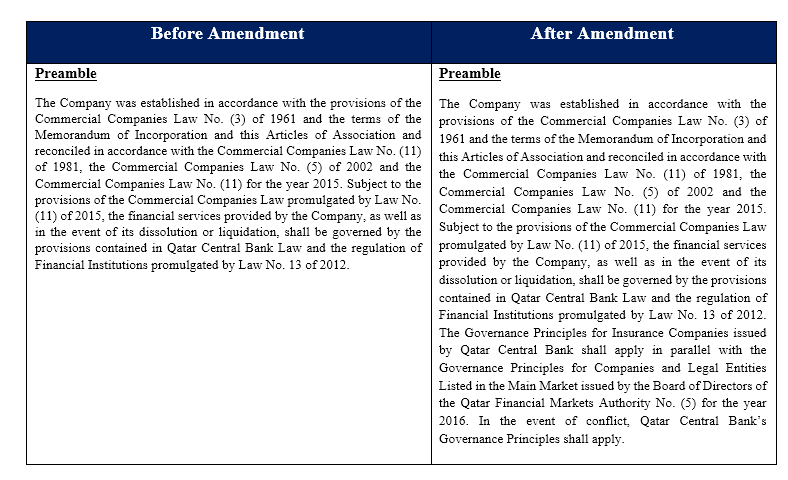 Shareholders’ Extraordinary General Assembly unanimously approved amending the Company’s Articles of Association (as per the enclosed schedule) in order to align with the Governance Code for Companies and Legal Entities Listed on the Main Market issued by QFMA’s Board pursuant to Decision No. (5) for the year 2016, and to publish all amended Articles on the Company’s Website. 4. Shareholders’ Extraordinary General Assembly unanimously approved authorizing the Chairman of the Board of Directors or the Vice Chairman to solely sign all required documents necessary to amend the Company’s Articles of Associations.